TORONTO – That Judy Dench stars as the venerable English queen in “Victoria and Albert” tells you all you need to know about what to expect from another tale of one of the widowed monarch’s odd friendships. The Abdul of the title is a young Hindu legal clerk who is ordered to Buckingham Palace from India in order to present the queen with a rare coin. Played by Ali Fazal, he is a handsome and awestruck fish-out-of-water who promptly violates palace protocol and charms the old lady in the process. In the eyes of director Stephen Frears and writer Lee Hall, the ageing Victoria is as indifferent to the rules imposed by her courtiers as she is to the Indian coin. She is struck by the young man’s smile and bearing, not to mention that upon meeting his empress, he falls to the floor to kiss her feet. She insists that he remain to be a footman and then companion. It cannot end well. A cast of familiar faces such as Michael Gambon, Olivia Williams, Fenella Woolgar, Eddie Izzard, Simon Callow and the late Tim Pigott-Smith can play stultified politicians and palace types in their sleep but Hall gives them little to do but raise eyebrows and try to hide their innate prejudices. Conflict grows in a predictable manner. The scenery, including Arundel Abbey in West Sussex, is delightful, the luxurious production design observant and Thomas Newman’s lyrical score is a pleasure. Dench displays with typical subtlety her established range of facial expressions to convey everything from anger to delight to sadness. That the queen ever held liberal views on the subjugation of a sub-continent is a dubious construct in the extreme but no doubt the illusion of nostalgia will appeal to those willing to overlook the film’s overweening subservience. Venue: Toronto International Film Festival; Released: U.K. Sept. 17 (Universal Pictures), U.S. Sept. 22 (Focus Features); Cast: Judi Dench, Ali Fazal; Olivia Williams, Michael Gambon, Simon Callow, Eddie Izzard, Tim Pigott-Smith, Fenella Woolgar, Adeel Akhtar; Director: Stephen Frears; Writer: Lee Hall, based on the book by Shrabani Basu; Director of photography: Danny Cohen; Production designer: Alan MacDonald; Music: Thomas Newman; Editor: Melanie Oliver; Costumes: Consolata Boyle; Producers: Tim Bevan, Eric Fellner, Beeban Kidron, Tracey Seaward; Production: BBC Films; Cross Street Films; Perfect World Pictures; Working Title Films; Rated: U.K. PG; running time 112 minutes. 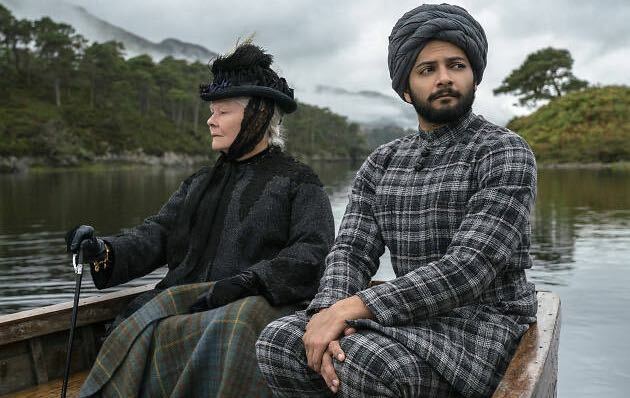 This entry was posted in Film, Reviews, TIFF Toronto International Film Festival and tagged 'Victoria and Abdul', Adeel Akhtar, Ali Fazal; Olivia Williams, Eddie Izzard, Fenella Woolgar, Judi Dench, Lee Hall, Michael Gambon, Simon Callow, Stephen Frears, Thomas Newman, TIFF, Tim Pigott-Smith, Toronto International Film Festival, Working Title Films. Bookmark the permalink.